The town of Cape Vincent plans to adopt a new zoning law – which includes strict restrictions on wind farms – in August before the state makes amendments to Article X of the 2011 Power NY Act. Two public hearings are scheduled. The first, hosted by the Zoning Law Revision Committee, will be at 6 p.m. June 27 at the Recreation Park on James Street. The second one is the Town Council’s joint hearing for both the updated zoning law and the comprehensive plan, which is tentatively set for July 21, same location. Cape Vincent officials have discussed scheduling a special meeting Aug. 1 to vote on adopting the proposed changes. The town is the proposed site of BP Wind Energy’s $300 million Cape Vincent Wind Farm project, which would produce approximately 200 megawatts of electricity. Article X regulates the siting of electrical energy-generation facilities with more than 25 megawatts. The area in white is the only portion of the town of Cape Vincent where wind turbines could be erected under a new proposal that town planning officials are considering. Under the new draft zoning law, setbacks for wind turbines will vary depending on the height and location of the structure. Noise limits for turbines will vary depending on the time of the day. ■ Six times the total height of the proposed structure from the nearest residence, the nearest project boundary line, boundaries of adjacent towns and any road. ■ Two miles from Lake Ontario and St. Lawrence River waterfronts. ■ 1.25 miles from boundaries of the village of Cape Vincent and hamlets of Rosiere, Millens Bay and St. Lawrence Corners; from Route 12E; Seaway Trail; National Scenic Byways and schools. ■ Daytime (7 a.m. to 7 p.m.), 45 dB. ■ Evening (7 to 10 p.m.), 40 dB. Under the proposal, the C-weighted, or low-frequency, wind turbine noise limit will be 18 dB over the A-weighted limit and both levels must be measured 1.5 miles from a commercial turbine. Also, if operation noise contains a “steady pure tone” – such as a whine, screech or hum – the upper noise limit is to be reduced by 5 dB; for “impulsive noises,” the limit is reduced by 7 dB; and for “highly impulsive noise” by 12 dB. 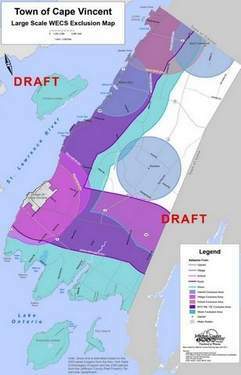 Cape Vincent’s proposed restriction on “big wind” does not end there. The new law would require all power transmission lines from the tower to any building or other structure to be underground. Furthermore, Cape Vincent would require developers to address complaints within 24 hours and provide proof of “continuous liability insurance” of $5 million per occurrence with a total policy minimum of $20 million per year. Developers would be required to conduct several impact studies, including shadow flicker, visual and noise impacts, wildlife impact, electromagnetic interference and stray voltage. Developers would have to conduct additional studies and provide plans for cultural, historical and archaeological resources; operation and maintenance, and fire protection/emergency response. After taking over Acciona Wind Energy USA’s proposed St. Lawrence Wind Farm project in Cape Vincent, BP in February hinted it would submit an application to the state’s siting board under Article X if the local government adopts a strict wind law.